This past week and a half, but particularly the weekend has been full on with magic in all its glory. Anyone who knows me will know that I am and always have been a firm believer in magic and the power of it, in all its variety of form, so that may seem like an obvious statement to make. But sometimes, something goes beyond reasonable expectations and that happened this weekend. Coming up with ideas for camp themes is not something that gets easier as time goes on. 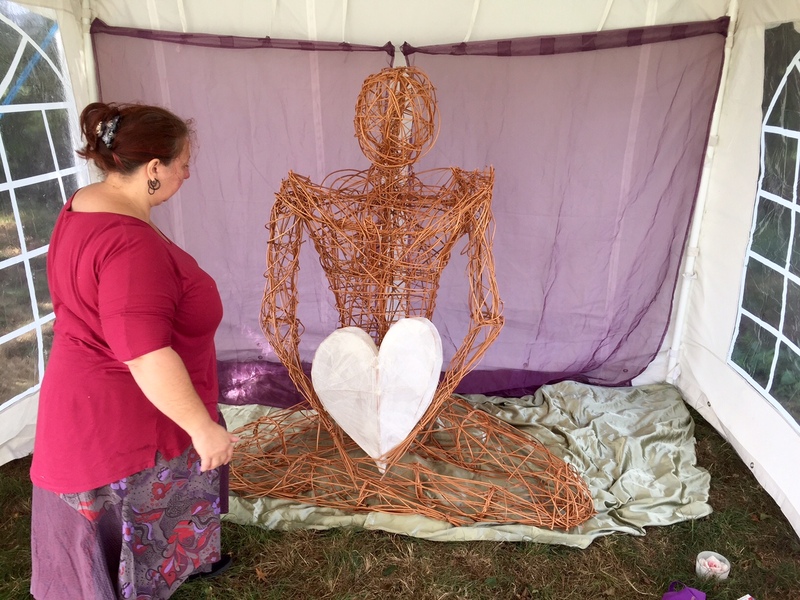 Over the years Damh and I have explored many magical ideas to play with at the Anderida Gorsedd camps and usually there is a lot of research, indepth work put into the theme and often heated discussions on how we should frame the information. When attempting to turn an idea, myth or ancient poem into a journey that will engage seventy or more people it can create an interesting dilemma, just how do you turn something etherial and enigmatic into a physical process that people can immerse themselves in in order to find a deep, meaningful and positive magical connection? With this camp we were feeling under pressure from too much stuff happening in the mundane world to find a whole new subject to research, so we enlisted the help of a couple of our good friends, Heather and Garry. We got together one evening to have a bite to eat and also chew over some ideas. From that evening of chat we came up with an idea of a magical healing cauldron and working with herbs, inspired by the work our grove had been doing this year with the the Anglo Saxon ‘Nine Herb Charm’ from ‘The Lacnunga’ or ‘Leechcraft’. It also happens that we are lucky to have as a good friend to the Gorsedd, Stephen Pollington who is an Anglo Saxon expert and can always be persuaded to come along to our events to give fasinating talks, so we contacted him. Luckily Steve was free and agreed to come along and present us with a talk on the subject of Anglo Saxon charms. So a basic idea and some academic, thought provoking aspects for the camp sorted, good stuff. 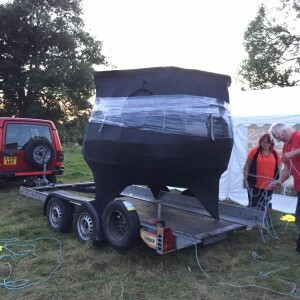 We left their place knowing that the inimitable Garry would be making us a cauldron to be proud of; this is Garry of the 50 foot long burnable boat for the Spoils of Annwn camp, a burnable Owl for the Blodeuwedd camp and so on, we knew it would be good! Next Damh and I had to focus on the details, details, details, details, what do we actually do? We needed a plan of action for an afternoon workshop and the ritual. What did we want to achieve? What was the point of the ritual? What did we feel the community might need or want from this camp? What did we need? In my head, for our grove work, there was always the want to build a figure to receive the magic on behalf of the group, I thought maybe an unfired clay figure, that we could leave where ever the spell had taken place, to return to the earth taking the herbs and magic to be transformed by the elements as it returned to the Mother. Somehow we would imbue the “everyman” with our wishes and anoint him with the herbs and chant over him, it felt powerful in my head, but not for camp, camp needed something else, I continued to think on it. We deciding to make the ritual a truly magical spell. The camp community would create charms to be chanted, invoking the spirits of the plants to be our allies. We would make the afternoon a journey to meet the spirits of the plants, engage with their energies and see what gifts and knowledge the plants would guide us to. So Damh and I set about finding seven native plants that would cover almost every aspect of healing, purification, attraction or deep working that felt right to include. It came down to Vervain, Wheat, Mugwort, Chamomile, Juniper, Yarrow and Bramble which Damh gathered from our local environs. Our plan was to break the community into seven groups who would each work together with a mixture of meditation and talking to make a seven line charm for each plant. This charm would then be chanted in a call and response withing the ritual as each herb was put into the cauldron, which by now had been built by Garry and was about seven feet tall and at least been 8feet wide. Groovy, this was a great plan! What would go into that epic cauldron along with the herbs? Well, people would take time to sit and contemplate what they needed to deal with right now in their lives, whether that be emotional, physical, or spiritual, write it down on pieces of paper to be placed in the vessel. Also, by now, I was being haunted by this vision of a guardian or avatar for group. He would sit, listening to each prayer, wish or plee and in his lap he would hold a heart shaped box into which people placed those things that needed transforming, this would be a vessel to follow the herbs into the cauldron. Clay just did not feel right it needed something less solid more etherial, it needed to be a willow sculpture. A week before camp, amidst the noise and mess of our house being rebuilt, I set about making the ‘Ghost in the Machine’ as I called him, I say him but I tried hard not to make any gender specification obvious, that felt important. I had never worked with Willow before and I have to say that I am not sure that I would make a hobby of it, but slowly over the course of a few days his loose form came together. The builders watched the progress and at one point one, with a wry grin, asked if I was building a wickerman and was I going to sacrifice a virgin. I laughed and replied virgins were a bit scarce in these parts. Funny how such lurid things stick in people’s minds, thankfully these days not too many are afraid of that particular bit of druidic legend, not around Brighton way at least. After a week or so the two halves of the ‘Ghost’ were finished, I was not happy with it, I did not feel I had done it justice. 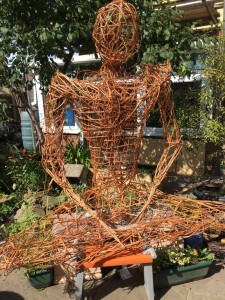 The form was rough, loose and untidy, but I took him into the garden to see how he fitted together and get a better idea of size, which was about a head taller than my five feet and he was in a sitting position or would be when his legs were attached. Damh, as usual, shook his head at me as I critisized everything I had done whilst we lowered the torso onto the legs. Right up until the pieces came together I really thought it was a terrible failure and then the two halves formed a whole. Like a bolt out of the blue I was hit with a sense of love, peace and nurturing. I was overwhelmed with the wave of emotion and burst into tears. 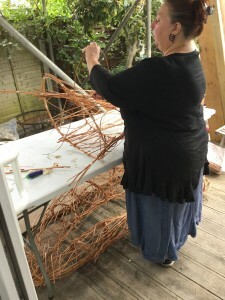 I felt something, someone, flow into the willow figure, a real sense that some entity had been waiting for me to finish so they could manifest inside this willow structure. Even the builders stopped and looked out from the roof space, where they were working, to see what was happening as I stood there welling over with emotion, “oh ye of little faith” said one as he dissapeared back inside the loft, Damh laughed. Eventually we took the two pieces apart, he was too big to get in our car so couldn’t stay whole. The next day I started on the ‘Heart Shaped Box’, a willow and white tissue paper lantern that would sit in his lap to recieve our wishes. That was easier and was accompanied by Nirvana singing in my head the whole time (Heart Shaped Box, great song), I just hoped others would feel the presense of the ‘Guardian’ the way I had. I sent a picture to Heather and was gratified at her response, hopefully this would all work. So the frame work of camp was set, the ingredient built, gathered and focused. So after months of thinking, planning and ‘creative debate’, it was off to camp to put everything in place and see where the magic would take us. The various marquees went up, the large ‘box of delights’ as it has been known for many years, to be the gathering space, one to protect the huge cauldron from the weather and one to be the meditation space. 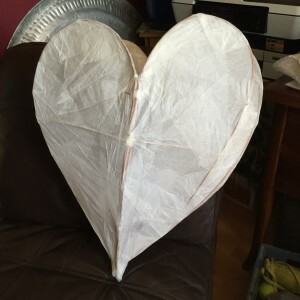 Each was decorated appropriately and the ‘Guardian’ was placed in the meditation space with his heart shape box, which was also set inside with a candle (battery operated obviously), everything went up easily and quickly. The stage was set for magical shenanigans and the weather gods were offered four pints of the best mead, if they would make the weather good for us to do all we needed to do. Friday people arrived and it became obvious that the vibe of camp would be happy and full of love. We sat together singing and laughing, the weather was beautiful, it was a great vibe all day and into the evening. Saturday morning, the weather took a turn for the worse, but we all spent much of the day in the marquee, firstly listening to Stephen Pollington’s brilliant talk which was full of light bulb moments, where everyday words and phrases in the English language suddenly took on a whole new and expanded meaning, reminding us of just how much we have lost over the years of our own magic and mysteries, then after lunch as the rain came in hard, we returned to the marquee for the Herb connecting, charm/chant making workshop. Everyone gathered in seven groups of nine or ten people to work together, Damh and I led a twenty minute drum meditation guiding people to journey inward to find and connect with the energy of their particular group’s randomly selected plant. Each group followed their meditation with a talking stick to share their journeys within the group, then each person wrote a line, a word or phrase to build the group’s herb charm. We listened to their journeys from the side lines and it was obvious that the magic was flowing freely throughout the afternoon as the gasps and laughter drifting across the tent, as the similarities to each other’s journeys where seen, felt and understood. Word by word, line by line the charms came together. All afternoon the rain came down, the wind blew and Damh spent the afternoon panicking and constantly looking at his weather apps. I wasn’t worried, the weather gods had only let us down once, mead was offered and I held faith that the gods would come through after all this stuff is all about them! Over the Saturday people visited the Guardian, spent time in his/her company and put their wishes and needs into his care. Slowly, very slowly, the weather cleared, the cauldron was uncovered and primed with dry tinder under it for the sacred fire to be lit at the appropriate time and only an hour late we were able to call everyone to the central fire to begin the ritual. We kept the intent, we walked to the Guardian, thanked him for holding us and our intentions and gathered up the shining heart shaped box to processed, in torch lit silence, to the dark, imposing cauldron of transformation that waited in the west. Each group was called to stepped forward to speak their charm three times and then put a bag of their herb into the cavenous bowl. The power behind the words echoed across the field as once, twice and three times the seven herb charms were called out with fervent intent and each herb bag placed into the patient vessel. When all the herbs were given to the cauldron it was time to place in the heart. When all was safely in place we held our collective breath as the torch bearers stepped forward to light the fire which would take the herbs, a heart full of intention and the cauldron on a firey journey of transformation and release. What happened then took us all by total surprise. We stood chanting the charms in a cacophony of words, drums and intention as the flames licked around the base of the great vessel, then a tower of heat and flame blew skyward and sent us all scurrying backwards away from the fire. The cauldron (made of relatively thin papier mache) stayed intact on the outside for far longer then anyone could have imagined as the tower of flames roared up from its cntre for thirty feet or more into the air and for several minutes. We all stood agog for a second or two before breaking into elated cheering and wooping as the structure of the cauldron finally succombed to the intense heat and buckled in on itself. 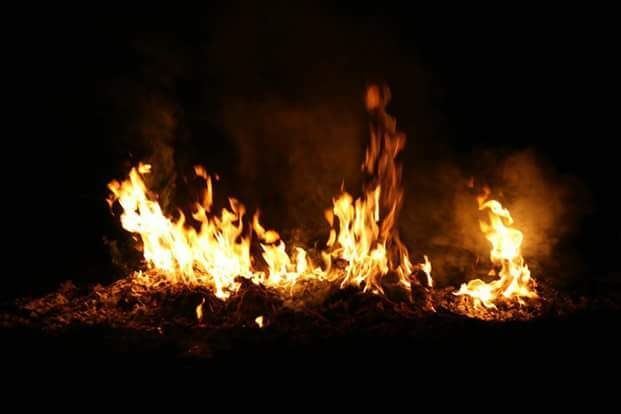 We watched the fire continue to burn for some time before finally singing some awens as a finish to the ritual and leaving the fire to die down. In truth the fire took an hour or more to fully die down, this was quite a mystery as the cauldron, although large, was not a solid construction and apart from the heart and the herbs there was little to create such a huge or intense flame, but burn it did and with beautiful colours dancing and moving through it. But that was not the only magical thing that happened with that fire, after the ritual one of our fabulous photographers Billie Wilson decided to take some photos of the flames. She stood back from the dancing flickers, that were still around three feet high, and took some shots. What she shared in the view finder shook all of us. There stood in the midst of the smoke and fire was a walking figure so similar to the willow Guardian that it took our breath away. It was as if he was checking all was well with the heart shaped box and its contents, making sure spirit received every prayer and wish through the transformative fires. After that we spent a raucous night around the camp fire, everyone wanted to dance, sing and be merry. The stars were bright, the air clear and we felt free. It seems that the magic of this camp was important, potent and much needed by all. The Otherworld was with us in so many ways this weekend, as it always seems to be at the camps. It is a privilege to be able to do what we do, to share this with people we care for and to honour the gods and spirits of the land. We are given gifts beyond measure to take those out into the mundane world so the ripples can be felt far and wide. Some things are inexplicable, this wonderfully full weekend was over flowing with inexplicable happenings as well as out and out love. Magic is a mystery that I will continue to explore until my dying day and I hope the gods of this land will continue to be a guide and an inspiration to me until, and hopefully beyond, my last breath. To all fellow pilgrims who seek to reclaim the old paths and make them relevant to a modern age, magic is only a heartbeat, an inward breath and a blink of the eye away. We only have to truly open our heart to community and the otherworld for it all to come tumbling into our lives. What an amazing time. That weekend will stay with you and all who were there, for the rest of your lives. How privileged you all were to have witnessed these magical things. Thank you for sharing this. I needed the reminder. Cerri, THANK YOU for sharing this story, Your story telling carried me there. I simply loved this. Blessings to you and Damh, always. thank you for sharing this journey, you took me along with you as well. I had been hoping for some high magic and I was blown away by this weekend. Fabulous. Thank you for dreaming something so wonderful into reality. Wow! How wonderfully amazing. Spirit works in wondrous ways, we all know, and spirit really did for you this time too. Incredible cauldron x guardian x heart box. Just beautiful. Thank you for sharing so beautifully- felt I was there with you all. What a wonderful story! It seems your Spirit continues to inspire still. For reasons too numerous and complicated to note, there has been a two year + period in my life that has included very little of this sort of multilevel creative ritual transformative process. Just within this past week the barriers have begun to fall away, inspiration returning, my beloved journals and haunts and passtimes calling me to return, and this story is like the grand finale I needed to open the last door. Thank you for sharing your process in such great detail that i could feel the wonder of it!!! Hello Colleen, Thank you for your lovely comments. I wish you well on your re-newed journey, may the gods guide and support you to where you wish to be.